Our K-6 Elementary School students enjoy a number of activities outside of the classroom. From field trips and retreats to special assemblies and holiday celebrations, our boys and girls in the Lower School enjoy an enriching classroom experience during the school day. These memorable assemblies, special events, field trips, holiday activities, and enrichment programs make learning fun and build a sense of community among the school’s younger students. In the after-school hours a variety of enrichment activities are available for a fee through the After-School Adventures Program — offerings change with the seasons but may include activities such as drama, cooking, chess, and music lessons. Students in all grades are invited to join in a variety of academic, sports, and arts clubs through this after-school enrichment program. Student meet once a month during lunch to discuss the book of the month! Club 4 Change is open to grades 1-4, and meets twice a month. The club was originated to create awareness of those in need around the world, and encourage students to do whatever we can to help. The goal is to make a positive change in the lives of those suffering, to heighten global awareness and to make our world a better place. Culture Club is Oak Knoll’s multicultural association in the Lower School. At meetings, members share their cultures and ethnicities and discuss current topics about diversity. Activities include book discussions, round-table talks and presentations to broaden the discussion of diversity at Oak Knoll. Sometimes members present multicultural topics at school assemblies. Students in all grades are invited to sign up for Drama Club through our After-school Adventures program. Students share their performances at our schoolwide Friday assemblies. Students in grades 4-6 participate in weekly engineering activities in the Science Lab. We work through the engineering design process to find solutions to fun problems. Activities range from how to make the stickiest slime to which reindeer antler design will hold the most candy canes. Tinker, Make, Create - Students are designing prototypes and discovering their own genius ideas to share with the world. Students in grades 5 and 6 are invited to join in the creation of our Lower School newspaper. This newspaper will be published once each trimester. Students will conduct interviews, take photos, write articles, and design the layout of this special newspaper. Open to grades K-6, this monthly club invites students to join in the saying of the Rosary during recess time. Rosaries and instructions are provided. Students gather in our Chapel and bring their intentions and prayerful hearts as we join in prayer to our Blessed Virgin Mary. Students in grade 6 provide leadership through action in their roles on the Lower School Student Council. Elections for the offices of president, vice president, secretary, and treasurer take place in the spring of fifth grade. In the fall, students in grades 4 to 6 are invited to run for class representatives. Monthly student council meetings are a time for representatives to bring student ideas and concerns to the student council. The student council also helps in a variety of leadership roles throughout the year. Photographers and editors in grades 5-6 discover and explore their passions while learning the ropes of the school yearbook. One of the most cherished Holy Child traditions is the Christmas Concert. Children in grades 1 to 6 join in a chorus of Christmas carols while a live tableau of the Nativity is enacted on stage. Kindergarten children participate in their own Christmas pageant in the Chapel of Bonaventura Hall. As an extension of the curriculum, field trips are scheduled for each class throughout the year. Students have visited the New York Tenement Museum and Sandy Hook, sailed on the Clearwater up the Hudson River and visited the Buehler Challenger Science Center. Elementary school students, teachers, and parents end the school week together at a weekly assembly several Fridays a year. At this gathering, grade levels highlight special projects they are working on in the classroom, students showcase their talents, and student leaders practice public speaking. We feel it is important to expose students to public speaking and leadership opportunities at a young age. 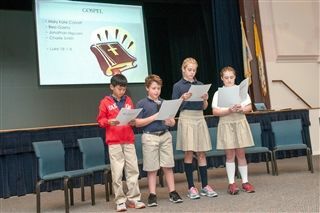 Friday Assembly also features a Gospel reading by members of the sixth grade and an interpretation by students or faculty. Grandparents and other special friends of students in kindergarten through fourth grade visit campus as part of an annual holiday tradition at Oak Knoll that dates back more than 20 years! The Lower School celebrates Halloween in a big way! Students and teachers don costumes and parade around the campus on their way to a spooky assembly in the gymnasium. A traditional French custom is to wear creative chapeaux on the Feast of St. Catherine Labore in November. The Lower School children don all sorts of hats on a day in May as a tribute to a former student who passed away – and dearly loved Hat Day. Kindergarten children tell the story of the birth of Christ for their parents through their own Christmas Pageant held in Bonaventura Chapel. The Holy Family, Shepherds, Angels, Kings and Pages endearingly proclaim this blessed event with the sweetness that only young children possess. Students from kindergarten through third grade along with their teachers and families celebrate literacy through Literacy Night in which storytelling, music, dance and art underscore the importance, value and fun of reading. Students in fourth grade participate in a traditional May Crowning with flowers of the statue of the Blessed Mother in Bonaventura Chapel. What is not traditional is that students plan the entire prayer service themselves. From the choosing of Scripture readings, prayers and musical performance, to the actual making of rosaries and the wreath of flowers, the fourth graders devote themselves to this endeavor. Students invite their parents and fellow classmates to pray with them at the May Crowning. Sixth graders, during their final trimester of school, embark on the study of William Shakespeare, his life and elements of his plays. The culminating activity of this study is the enactment of scenes from a Shakespearean comedy or tragedy. Students in full costume perform outside on the patio before an audience of parents and underclassmen. Always a highlight of the sixth-grade year! The Spring Arts Festival celebrates all the arts at Oak Knoll: music, dance, art and creative dramatics. Students in grades K to 2 have a daytime Spring Arts festival, including a concert and end-of-year art showcase. In an evening performance, students in grades 3 to 6 sing, dance, play instruments and perform in one act plays. A display of student artwork follows the performance. Students and their parents explore subjects ranging from science, technology and engineering to art and math through Super Science S.T.E.A.M. Family Events taught by Oak Knoll faculty.